The search for desperately needed affordable housing recently got a boost from the Metropolitan Transit System (MTS), whose board voted unanimously in October to allow underutilized parking lots to be transformed into affordable homes. 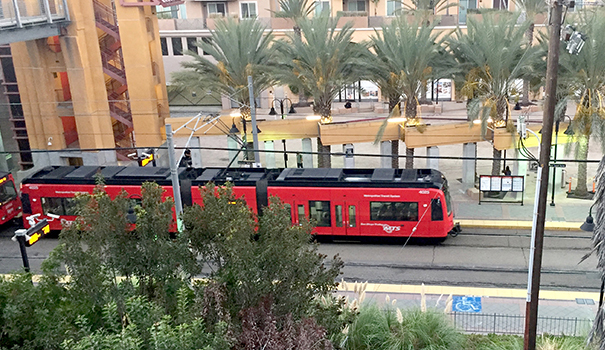 MTS board’s vote followed release of an April report by Circulate San Diego titled “Real Opportunity,” which provides detailed recommendations for how MTS can stimulate the creation of new homes adjacent to transit stations. The report included new research demonstrating a large number of MTS-owned parking lots are substantially underutilized. “It won’t be until next year that Requests For Proposals (RFPs) go out,” said Rob Schupp, MTS director of marketing and communications, about transit parking redevelopment. An RFP document solicits business proposals through a bidding process from agencies or companies interested in procuring a commodity, service or valuable asset. Schupp noted MTS has already been active in developing its transit-station properties. Villa Encantada is the redevelopment of an underutilized parking lot next to a trolley station on 1.7 acres. It will include 67 low-income family apartments offering replacement parking for MTS while providing 1,000 square feet of retail space. the most likely areas to be developed for housing under the new MTS plan. Schupp pointed out another major rental project at the Grossmont Transit Center in La Mesa has been developed with 527 units (15 percent affordable). In that project, underground parking was required for transit use. MTS leased the property for 99 years. “We project revenue to be more than $600 million over the length of the lease,” Schupp added. Circulate San Diego, a regional nonprofit dedicated to advancing mobility, has proposed alleviating the affordable housing crunch by transforming MTS parking lots into low-income housing. 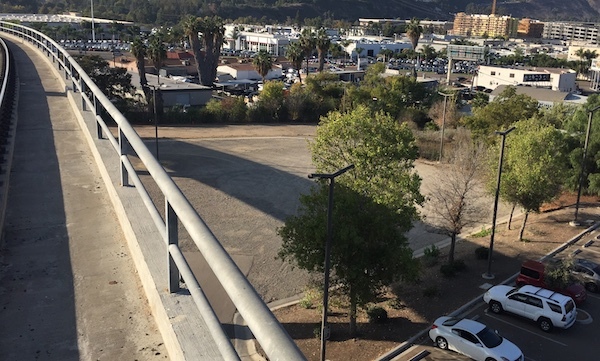 Circulate’s proposal, published in the Real Opportunity report, shows MTS has at least 57 acres of available property, much of it underutilized transit parking lots. Circulate San Diego has gone on record estimating those marketable MTS properties could support development of 8,000 new dwelling units, of which 3,000-plus could be reserved as permanently affordable low-income housing. Two spokespersons for the San Diego Housing Federation, which advocates for regional affordable housing, said reuse of underutilized trolley parking lots is a step forward. But they insist some of the rules of the game need to be changed. Federation policy director Laura Nunn said providing affordable housing in MTS parking lots serves two purposes: reducing greenhouse gas emissions while offering low-income residents a viable transportation option. MTS is all in on helping out where it can with affordable housing development, said Schupp. But he added it is only one small answer to finding an overall solution to the affordable housing crisis. Schupp noted estimates are that the regional shortfall of affordable housing presently exceeds 100,000 units. He described Circulate San Diego’s estimate of accommodating 8,000 affordable housing units on MTS’s approximately 60 available transit station acres as overly ambitious from a zoning perspective. Russell is optimistic about ultimately finding ways to supply the growing need for affordable housing region wide. —Dave Schwab is a San Diego-based freelance writer. Reach him at dschwabie@journalist.com.